People throughout Massachusetts know Doggy Dates for exceptional, reliable dog day care. Natick dog owners come to Doggy Dates when their pups need to spend a little extra time in the great outdoors, socializing with members of their own species in a safe and enclosed environment. Our daycare services take place on an acre of beautiful farmland in Natick, fully fenced and privately owned. If you have to spend more time away from your dogs than you like, our affordable doggie daycare services are an ideal solution. Dogs are social animals that thrive on interactions with humans and other dogs. Doggy Dates’ doggie day care is the perfect way to socialize your dog in a safe, well-run environment. Our playdate supervisors get to know your dog’s socialization style and personality, ensuring each one gets the right amount of exercise. Get to know our friendly and professional team members. Increase your dog’s happiness and decrease your guilt with help from Doggy Dates. We pick your dog up from your home. We’ll give you a 90-minute window for pick up, but you don’t have to be home when we arrive. We’ll follow your directions, picking your dog up on your schedule. We offer doggie day care in Natick Monday through Friday, rain or shine. Sign up for daycare once per week or five times per week – it’s up to you. Our rates get cheaper the more days your dog plays! We transport your pup to our daycare facility. We had our customized Scion XB tailored for dogs, with a private section of the car just for them. Our doggie mobiles are a symbol of Doggy Dates, and your pup will grow to recognize and look forward to seeing it pull into the driveway. If your doggie gets scared or sick in the car, simply let us know, and we’ll be sure to accommodate his or her needs. We arrive at the privately owned Doggy Date acreage. Dogs can run, jump, and play to their heart’s content in our more than one acre of gorgeous outdoor farmland in Natick. We take your dog off leash so he or she can enjoy freedom in the great outdoors … the great fenced-in outdoors, that is. We know your dog will love our large play area. View our day care gallery. We supervise your dog’s playtime. From beginning to end, playdate supervisors watch the dogs and ensure they are having a good time. Our supervisors get to know each dog closely for tailored doggie day care. Natick dog owners who want peace of mind while their pups play can trust the leader in dog daycares, Doggy Dates. We don’t allow aggressive dogs in our day care, so your fur baby will be safe. We return your pooch. Once your dog’s scheduled playtime ends, we’ll deliver him or her safely back to your home. We always make sure to wipe all four paws after leaving the daycare, so you receive a clean, happy, and tuckered out doggie. We hate goodbyes – schedule your next daycare service so we know when we get to see your dog again. If you want to enroll your pup at Doggy Dates for supervised, safe, and convenient dog day care in Natick, contact us for a free trial. Your dog’s first daycare session with us is on the house! We know you’ll love our services and are confident in handing out a free trial. Our passion for our canine clients is unparalleled, and you’re sure to experience the Doggy Dates difference in the first doggie playgroup session. 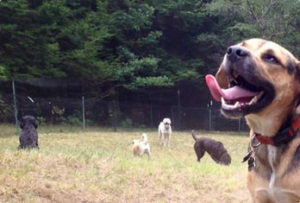 What Makes a Good Dog Day Care? Clean, safe premises. Your dog’s daycare facility should be safe and secure, with no dangerous objects or holes in fencing. There shouldn’t be feces lying around, and there should be plenty of fresh water. If there are individual rest and play areas, both should be clean and kept. Constant supervision. Dogs should never have a free-for-all at a daycare without human supervision, especially when off the leash. The company should have professional, trustworthy, and knowledgeable daycare supervisors to ensure the safety and happiness of dogs at all times. Screening process. While we love all dogs at Doggy Dates, we unfortunately can’t take pups without proper vaccinations or those with aggressive tendencies. Dog daycare screenings are for the dog’s own good and ensure no dog hurts another while at daycare. Affectionate and well-trained staff. The people in charge of watching your dog should be loving, compassionate, and trained to handle groups of dogs. Only trust a qualified team of professionals with your dog’s wellbeing. A dog day care in Natick should check off all these boxes. The most important thing is to feel comfortable and confident when your doggie leaves the house for daycare. You should feel a good, happy vibe from the daycare. Your dog’s happiness is the top priority. Partner today with a reliable daycare that takes this priority seriously, such as Doggy Dates, the leader in doggie daycare. To learn more about our services for dog day care, Natick dog owners can call (781) 801-2526 or connect with us on Facebook today.